This is the second time I got that unloved "Stop! Look and Listen" for a question I voted to close after reading it several times and trying to understand it. 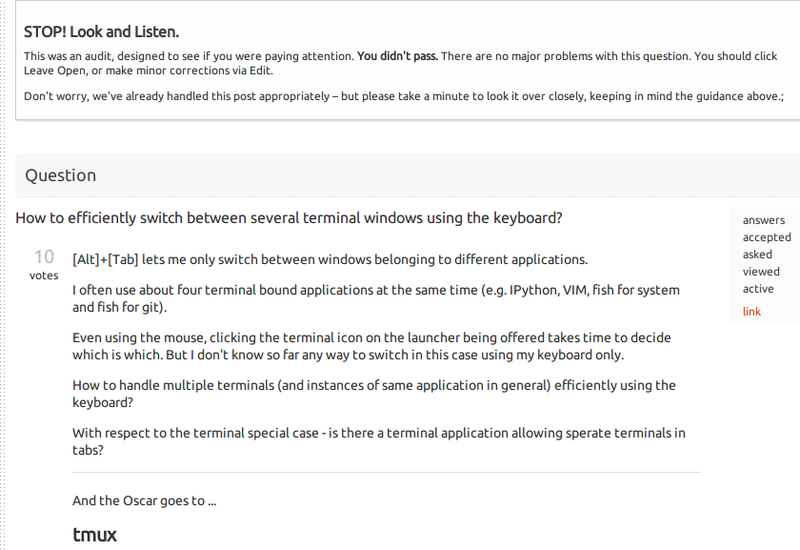 The question really is not clear to me: it seems he is asking for a shortcut like ALT^ that switches between windows of the same application, but then he states Oscar goes to tmux - which left me only with several ???. After having read several comments I want to point out that I didn't want to discuss if this question should be closed or not - my purpose was to show that it is entirely possible for one question to be regarded as good by some reviewers and as bad by others - all acting in good faith - so those audits (in the close queue) eventually will go wrong. No, actually the lack of a well defined quality policies will dismiss the usefulness of the audits, I've failed 2 audits already just because of this (and went outside of the queue and voted to close them). The system selects seriously upvoted posts as examples, but upvotes is not the face value of a post (for example this Comparison of backup tools). So many answers and yet the (subjectively) most valuable suggestion for me is delivered in a comment ... so ironic. This is a change of behavior in how to use the terminal and the window manager. For example, I normally don't have 2 window of the same application opened at the same time, meaning: 1 Iceweasel, 1 terminal, 1 Chromium, 1 zim wiki, 1 window of whatever, and then organize them by tabs. For me that's efficient since I don't use several terminal window. How to handle multiple terminals (and instances of same application in general) efficiently using the keyboard? ^ This is precisely what I don't do... why I would need several window of the same terminal when I could get just 1 and several tabs? Like I said earlier, the audit system is not smart. All it can do is take posts it sees as "good" (ones with lots of upvotes, both on the question and answer(s)). I'm not sure what all the system looks at, it probably looks at views too. But, in essence, the audit system relies on us to define what a good question is and what a bad question is. This is why I disagree with the current implementation of close vote audits, they're just too relative. AFAIK the audit system doesn't give out auto review bans, so I wouldn't worry about audits so much in the close vote queue. I'm actually hoping to get them pulled from that queue. Now, here is my opinion about that question. I understand it perfectly, the OP usually has many terminals up each running a different program and he doesn't like the "window spread" effect when he tries to switch between them, because it's hard to tell them apart. I would have suggested the same thing, a terminal multiplexer. Not the answer you're looking for? Browse other questions tagged discussion review audits .